The pliers are tougher, the blades are longer (as is the 9-inch ruler), and a blade exchanger lets you access most of the accessories from the inside as well as the outside of the tool. Here are some of the utensils you'll find on the Surge: multiple Phillips and flathead screwdriver heads, eyeglass bits for detail repair, two pairs of pliers, electrical crimper, three wire cutters, awl with thread loop, and 5 different blade styles. All tools lock into place and are made from 100% stainless steel. But here's the catch: this tool might just be too big. If you're used to the regular weight and feel of a classic Leatherman Wave, for example, then the Surge could pose some difficulties. 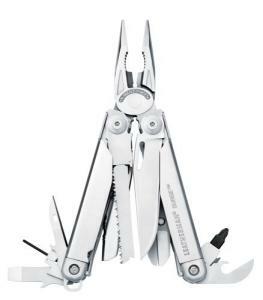 However, if you like the thought of a multitool bigger and heavier than the Wave, look no further. This Surge is for you.